Special Edition of 360 tonight at 8pm! Most of the news this week was about the debate, but I thought I would grab some of the more unusual views. 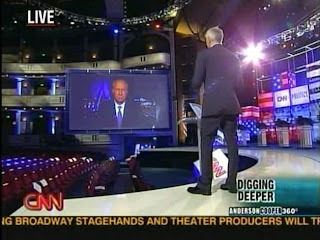 Above, Anderson points to the screen during the YouTube debate Wednesday night. And that's a mighty big screen! This is from the Tuesday warmup. Even with that big a picture, it must have seemed odd to be talking to his guests from the other side of the hall! And from last night's show, Anderson checks his laptop as we go to commercial. Note the BlackBerry within easy reach... guess his addiction is still strong! On American Morning today, John Roberts and Kiran Chetry previewed a story about vintage rock t-shirts that now sell for thousands of dollars. John broke out his Beatles accent (at least, I think that's what he was going for... ;) and also stumped Kiran with some classic rock trivia. And although Ali Veshi isn't a 360 alum, this was too silly not to share... when your money guy starts shakin' his groove thang, you know the markets have been volatile for too long! "Brisbane is my home but I live in Baghdad. For almost six years now I have only lived war. I leave Iraq twice a year and the first thing I do when I come out is go to a Thai restaurant; it's my first meal anywhere I go. I just arrived in Paris to cover the Rugby World Cup and I've already had two Thai meals. I love it and miss the taste. I miss the currency of the flavours, the richness of the food, the sparkle. I'm not a gourmet - I'm a man of very simple tastes - but, to me, Asian flavours are part of being a contemporary Australian, so I'd have Thai food for my last meal. Today I'm having Tom Yum Goong. I haven't had a spring roll in months so I'm going to have some of those too. And then there's the eternal decision - stir fry or curry? I think I'll go with the prawns in curry sauce. Before I left for Paris, I had just eaten in a restaurant in Iraq for the first time in two years. It was in the western Anbar province where the US Marines have a division. I went back to an important al-Qaeda village that Sunni insurgents had reclaimed from al-Qaeda only weeks before. They used to hang severed heads from butchers hooks on the main street. Al-Qaeda had owned this particular restaurant for years and had closed it when they shut down the village and all communal life. Now that the tide has turned there and Iraqis have the upper hand again, reopening the restaurant was a big deal. When I arrived in Iraq, after living in Kandahar, Afghanistan, for just over a year, it felt like a food revolution. For a while it seemed like the food had taste - we were eating kebabs, mutton, rice and chicken. Occasionally you'd see a salad and do cartwheels, particularly when you're eating the same lunch and dinner every day. I'm back to the same weight I was when I was 17. Forget Atkins. Forget the fad diets. You want to go to fat camp? Then get yourself to Iraq. The food is unattractive and poorly prepared so there's no motivation to eat, and when you do it can have serious consequences! Sometimes you starve for days so you're constantly hungry and you end up dreaming and fantasising about food all the time. At my last meal, I'd just have two members of my family. I don't like to talk about my personal life but the people I count as real friends wouldn't even fill this table. My world is actually very small. I come from a traditional Australian working-class background which I'm immensely proud of. My upbringing has helped to shape the man that I'm slowly evolving into. My favourite memory as a child was being with my father and stopping at these roadside food vendors - roaming meat-pie salesmen - who would sell food from the back of their trucks. They would park by certain main thoroughfares and roads in the neighbourhoods where we grew up and my father and I would stop for pie'n'peas. It's an English thing - a saucy pie filled with ground beef. The pie man would slice the crust off the lid and peel it back to spread mashed peas across the top before resealing the lid. To me as a child that was manna from heaven that came in a little white paper bag. Dad and I used to have a competition to see who could eat the thing without spilling it, because it was a very messy affair. I have very strong childhood memories of that. The sad indictment on my current culinary life is that I will go into a US military embed just so I can get to the chow hall. I'm not kidding. I remember watching M*A*S*H when I was growing up, and you'd see the slop they dealt out to the soldiers in the army mess hall; but it's certainly not like that now. They have salad bars as long as football fields, sandwich bars, ice cream parlours, and burger and corn dog stands. Then there's the main meal section, with fruit, veg and salad and an assortment of beverages that boggles the mind. I've been known to fake interest in military operations just to get to the food, and I think it's well known within the multinational force command that if they want to entice me out for an interview or a sit-down with a general, they offer a lunch and we'll do it in the chow hall. If they want to own me, they go via my stomach." Have a great weekend! Looks like we will see Anderson tonight after all! Dare I say I love this tie? Probably not, it will fall into that abyss, with my other favorites. I really can't talk about the Republican's again tonight. I just don't have it in me. So we'll move past the opening discussion, on Thursday's AC360, to other subjects covered. One note, it was wonderful to see Ari Fleischer. I wonder why we don't see Andrew Sullivan on 360 anymore? • It was very interesting to see Michael Ware roaming the streets of Baghdad. It seemed safe, but I wonder if it really was? As MW said what the US needs now is peace between the Sunni and the Shia sects. That will not happen by pointing guns and killing people. It will take time. Lots and lots of time. If you don't understand the difference between the two sects here is a link to a good read. •Drew Peterson.....what a slime ball. Have you ever met someone that is arrogant and flippant, like he is? I'm judging him, not giving him the benefit of doubt, but I'm just going with my gut. • What a great interview with Ayaan Hirsi Ali. Her fight to have Saudi law changed is truly an uphill battle. The only thing that is going to change Saudi law, as it concerns woman's rights, is world pressure. Women in many Muslim countries live by rules we, in this country, can't possibly imagine. Ayaan Hirsi Ali is an author, playwright and a political writer. She is the daughter of a Somali politician and revolutionary opposition leader. She was born in Somalia but moved to Saudi Arabia when she was very young. Her family then left Saudi Aribia to move to Ethiopia, eventually settling in Kenya. She sought and was given political asylum in The Netherlands in 1992. • Thursday's 360 blog entry by Kay Jones said "Keeping on the political beat, be sure to tune in Monday night when Anderson spends a day on the campaign trail with former Arkansas Gov. Mike Huckabee". 11:45 a.m. ET – Concord, NH – Speaks at Greater Concord Chamber of Commerce 2008 Presidential Forum Series at the Concord Holiday Inn, 172 North Main Street. 2:00 p.m. ET – Tilton, NH – Plays with the Tilton School rock band and speaks to students, faculty and local residents at the Tilton School , 30 School Street. 10:00 a.m. ET – Bedford, NH – Attends Coffee & Conversation hosted by Doug & Shannon McGinley at 4 Balsam Court. 12:00 p.m. ET – Manchester, NH – Speaks at College Convention 2008 at Center of New Hampshire Radisson Hotel, 700 Elm Street. 3:00 p.m. ET – Hudson, NH – Attends 90th Birthday Party for Beryl Reeve at 14 Falcon Drive. (By invitation only; open press). Keene, NH – Attends house party hosted by Rep. Dan Dumaine. 7:30 p.m. ET – Keene, NH – Speaks at Cheshire County Republican Committee/Cheshire Republican Women's Committee Joint Holiday Party at the Keene Country Club, 755 West Hill Road. Nashua, NH – Speaks at morning worship service at Grace Fellowship of Nashua, 43 Main Street. (Closed Press). •Remember there is no AC 360 on Friday evening. CNN is running a new Christiane Amanpour special about the political upheaval in Russia. •We have received John King's answers to our questions and they are just wonderful. I'll be posting them on Monday morning. How many times can you scream the word, "PINHEAD"? Okay, did I miss anyone? Yes I did. Mike Huckabee. I feel like Mike Huckabee is an honest and decent man. I don't agree with his views on any of the issues however he was the one candidate on that stage last night that could be called both honest and decent! I respect Mike Huckabee greatly. I just don't want him as my president. 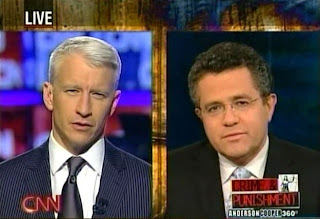 Since when is every controversy that happens on CNN Anderson Cooper's fault? I mean, I don't want to sound like some 'fangurl defending her man' but Jeezbus why is this latest controversy Anderson's fault? Ms. Phebe told me that John Roberts spoke with Brigadier General Kerr on American Morning in order to clear up some of the controversy. You won't find much support for CNN today in getting the truth out so I thought I'd share this interview with you so you can tell the spin from the truth. ROBERTS: So there's the question and Retired Army Brigadier General Keith Kerr joins me now this morning. We discovered after the debate last night that you are in fact a member of Hillary Clinton's lesbian, gay, bisexual and transgender steering committee. We did not -- we did a background check and we found that you have not made any campaign contributions to any candidate. Does that still stand? ROBERTS: OK. Well, let me ask you about your position on the steering committee. What does that entail, and have you in fact done any work for Hillary Clinton's campaign? KERR: I have not done any work. Several friends asked me if I would allow my name to be listed and I agreed because she is such a strong advocate of gay and lesbian rights. ROBERTS: So this really hasn't required anything on your part other than lending your name to it? ROBERTS: Now, did anyone from Hillary Clinton's campaign or from the steering economy or anyone else associated with a political organization put you up to the idea of asking this question? KERR: Absolutely not. This was a private initiative on my own. ROBERTS: So why did you want to ask this question? KERR: I wanted to ask it because I wanted to focus attention on the damage that "don't ask, don't tell" currently does to our military readiness. Every day, the Department of Defense kicks out two or three talented gay or lesbian personnel. And we're talking about intelligence specialists, surgeons, nurses, doctors, 58 Arabic linguists since 9/11. ROBERTS: And what was your experience like as an openly gay man to have to live in the closet of the U.S. military? KERR: Well, I enjoyed the army so much that I wanted to stay and finish my career. However, I did so in the reserves, and it made a wonderful career for me and made me a much better person. ROBERTS: But was it difficult for you? KERR: Because of the gender? ROBERTS: You're living two lives, basically? ROBERTS: Oh, even in this generation again. KERR: ... of your civilian or military job. And I wanted to be successful in life and it was necessary to not reveal my sexuality. ROBERTS: Right. On the idea of not revealing things, we didn't know again that you were a member of the steering committee. There was also a news release dated November 11, 2007, that lists you as a national co-chair on veterans and military retirees for Hillary Clinton. Are you in fact a member of that organization? KERR: Yes. It's the same one. Simply my list, my name on the list. ROBERTS: So it's the same organization? KERR: And both friends, yes. I think it's two separate lists to support Hillary Clinton. KERR: It never concerned me because I had not really participated in that. KERR: As a matter of fact, I supported several Republicans this fall. ROBERTS: Tell me about that.KERR: One of them is Aliana Rossladen (ph). KERR: And she's from the Miami area. She was in San Francisco recently at a fundraiser and I went and made a contribution to her campaign. ROBERTS: And you're a registered Independent. KERR: A registered Independent in California. ROBERTS: Oh, General Kerr, thank you very much for joining us this morning, explaining a little bit more about your situation. I can't say that we would have used the question had we known. Now, a lesson for us as well. But thank you for coming in this morning, sir. ROBERTS: And thank you for your service to the country. KERR: Thank you for being so transparent. I appreciate that. What won't I do for Anderson Cooper? I watched the Republican's debate on Wednesday night, for God's sake. Does that not prove my devotion? As my friend Sheryn said earlier tonight "My ears are bleeding". Seriously, it was just awful. But I did listen closely, just in case I can't vote for the Democrat's nomination. •I love John McCain. I think it's partly just his charisma. If you ever get the chance to meet him you'll understand. He's funny and irreverent and very, very savvy. If only he wasn't such a hawk. •Rudy and Mitt did themselves no favors tonight by going for the jugular. I heard from so many people that muted their televisions when it got too ugly. •I learned several things tonight, but the most fascinating was that Ron Paul was an OB. I don't know about you, but I have a real problem with thinking of someone who earns his living putting women in stirrups and looking at their hoo haas as Presidential. LOL. •Then there's Fred Thompson. Why does he remind me of John Wayne? I had to laugh at the lady in Erica Hill's focus group who said she doesn't care for his TV shows. In my opinion that's about the only thing I do care for. •Mike Huckabee lost me when I heard that he gave free rides at state universities to children of illegal immigrants. His reasoning was that they had gone through the public school system the same as legal residents, so they deserved that same scholarship rights. If I understood him correctly after we've given them 13 years of free public education we owe them 4 more? Unbelievable. Like with the last debate there was again some controversy, this time concerning Brigadier General Keith Kerr who spoke passionately (and much too long) about gays in the military. 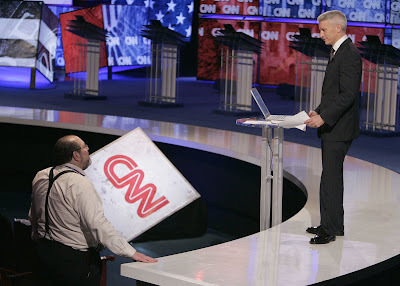 If you watched the debate he seemed to want to lecture the candidates more than ask them a question. Again CNN's team of producers didn't vet their audience participates very effectively. Before the program was over Bill Bennett disclosed Kerr's association with one of Hillary Clinton's election committees. This is not AC's fault, IMO, but that of the CNN research team. But, like the previous brouhaha, I'm sure he'll take the brunt of the criticism. Not fair. I'm sure you noticed that all of our question & answer participates (except Mike Watkiss) were on Wednesday's AC360. I wonder how John Roberts manages to be awake, let alone alert, for American Morning when he's still talking politics with AC at 11 PM? 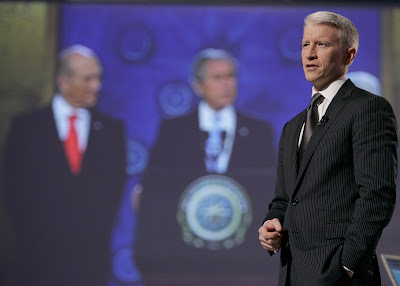 And if you haven't had enough Anderson Cooper photos here's a link to a slideshow from a Tampa television station. Enjoy. Wow, I finally get to guest-post the show and have the actual titular host! 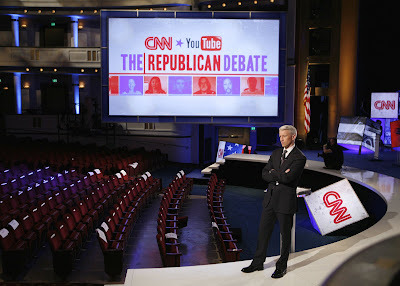 The show was broadcast from St. Petersburg, Florida, site of tomorrow's YouTube debate for the Republicans. I'm not one to start off with (or even mention, actually) the sartorial selections, but... Don't get me wrong, usually I admire Anderson's suits, but I have to admit, the one he wore tonight is never a favorite. The close pinstriping makes my TV screen vibrate, and that ain't pretty. Add that to the crazy-busy background they use for the debates, and I was reaching for the Dramamine! The first story was, of course, about the candidates. John King did a quick video rundown of them (it still amazes me to hear Guiliani referred to as a moderate) and then he and Gloria Borger joined Anderson on stage for a little discussion. Now that pinstripe, I like! It stays where it belongs and... Oh, sorry. Talkin' about the clothes again. *ahem* Although, do you think John forgot to pack a tie? Not that I'm complaining, mind you; I happen to like the casual look on him, it's just... Okay, okay, back to the substance. Next up, the Mideast Peace Summit at Annapolis. I think it's wonderful that Condi finally realized that Bush's legacy will also be HER legacy, but it really is about seven years too late to jump on this particular horse and expect a substantive resolution in *checking watch* 13 months. Especially since Bush has exactly zero credibility in the Middle East, so anything that comes out of this effort will be viewed with even more suspicion than most. There may be a couple of things that Bush hasn't yet done that could make him -- and us -- more reviled in that part of the world (bombing Iran comes to mind) but he hasn't exactly painted us as benevolent keepers of peace and promoters of democracy. My point, and I do have one (thank you, Ellen! ), is that I think David Gergen inhaled when he said we should give Bush credit for this. I was glad Anderson called him on it. 360 Bulletin: the story of the British schoolteacher in Sudan who may be given 40 lashes for allowing her students to name the class teddy bear Mohammed is just mind-boggling. I mean, I admit that if I heard a bunch of kids asking to name their teddy Jesus or Israel or Buddha, I probably would try to talk them out of it. But lots of boys are given the name Mohammed, maybe they were naming the bear after someone else? I don't know, but this certainly seems crazy. I hope they either drop the charges or end up just expelling her from the country. And from that to the light-hearted WWTT segment. The beauty queen lied?! Gasp! Oh no! Seriously, even yesterday when we thought it was legit, everyone looked at those pics and said, she had hives? That face is swollen? John Zarella did the update on the Sean Taylor story. My initial reaction to the "random or targeted" question was, who burglarizes a house they think is empty, discovers someone actually is home, and then kicks down a door to get to them? I'm no criminal genius, but I would think they would run out of there as fast as possible. It just feels like they were after this guy, for whatever reason. Such a shame. Thank God his girlfriend and baby were not killed. Not exactly sure when we got a "Crime and Punishment" segment added to the show (prior to last night) but tonight's segment is another one to make you grind your teeth. This is one of those stories that you just know will be turned into a "ripped from the headlines" TV episode soon... Well, once the writers' strike settles, anyway. Iceland the best place to live? Glad Anderson doubts that as much as I do. (No offense to any Icelanders who may be reading this!) And I thought the teddy bear toss was absolutely charming... just as long as none of them were named Mohammed. Have a great night, enjoy the debate, see you Friday! 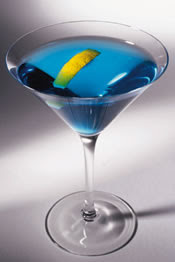 Forget the champagne, Anderblue Martinis for everyone!!! Phebe, we raise our glasses to you my friend! We hope you have a wonderful birthday filled with joy, love, happiness and many, many presents! And what better way to celebrate Phebs birthday then the return of The Man! WOO HOO! I'm sorry, vacation looks very good on Mr. Cooper! We covered most of last night's show during the morning post but I just want to say a couple of things about the politics of the night. First, I don't care if you are Oprah, Bruce Springsteen, Barbara Streisand or Susan Sarandon. I cannot stand celebrities stumping for their favorite candidates. But during every presidential election since I was old enough to care, the celebrities come out in droves in support of their favorite candidate. So now starts the 'photo-ops for votes' season. UGH! You know what would be refreshing? An actual presidential election where the candidate wins because of the issues they support. Nowadays I feel like the celebrity with the most clout wins their candidate the election. Isn't that sad? The YouTube Debate are coming to St. Petersburg! 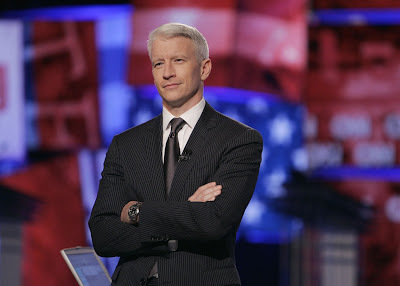 Much has been written about tomorrow night's debate but here are two Q&A's with Anderson Cooper for you to peruse! 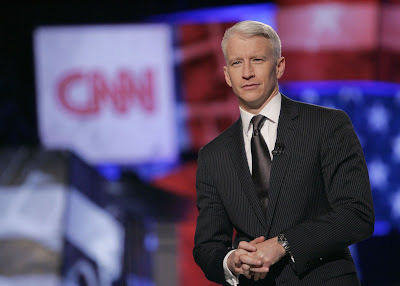 TownHall.com's Q&A with Anderson Cooper has a very conservative slant to their questions. 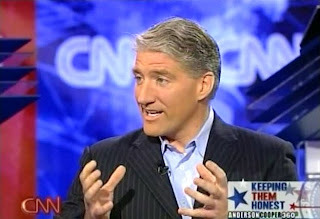 Yesterday, The Feed on tampabay.com also posted a Q&A with Anderson which was done right before the Las Vegas debates. Have a read. 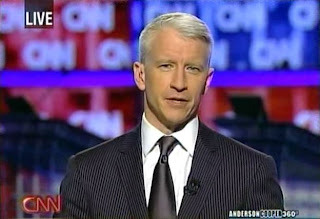 It was great to Anderson Cooper back at the helm for Monday's AC360. When Larry King did the toss he said AC was in Los Angeles, I assume that's due to his scheduled appearance on the Ellen Degeneres Show. I did some checking, but I couldn't figure out if Ellen taped Monday or this morning. Don't forget to set your TIVO's (times vary so check you local listings). Sapphire told me Ellen got Tom Brokaw to do a little dancing on Monday's show. Don't hold you breath but maybe she'll get AC to do a little sumpin? Monday's AC360 led off with a report on the candidates, by Candy Crowley. As Candy said 'Tis the season for body blows'. When I listen to the back and forth between Obama and Clinton I get very annoyed. The one thing the Dems need to do is present a united front. This sniping is not going to win them the election, no matter who the candidate is. After Candy's story there was a great round table with Republican strategist Ed Rollins, David Gergen and Katrina Vanden Heuvel, editor of The Nation. I was a bit surprised that Rollins and Gergen are putting so much stock in Oprah's announcement that she would campaign for Obama in December. Maybe they don't realize that women actually have brains and can think for themselves? If someone is going to vote for Obama just because Oprah tells them too.....wow that just leaves me speechless. Speaking of speechless....not much to add to John Kings excellent report on Rudy Giuliani's flip flopping on abortion. I am so sick of politician's talking out of both sides of their mouths. And while we're on the subject of abortion what did you think of Randi Kaye's report about doctors refusing birth control pills to patients? Shouldn't you be warned in advance, maybe when making an appointment, that the doctor will not prescribe birth control? What is a patient to do? Just go from doctor to doctor, paying co-pays, until you find someone that will help you? How ridiculous is that? Did you catch AC's comment after Kiran Chetry's tease for American Morning? He said "And how many cup holders does it have, that's the question......like the Simpson mobile." Anyone know what he was talking about? Thanks to Aruna and Sapphire I do. It's from an episode where Homer meets his half brother and designs a car with cupholders all over the place. Homer says "
"Like a place to put my drink. Not a little cup, but one of those 'super-slurpers at the Kwik-E-Mart." Anderson said he's headed to Florida today for the You Tube debates. He also said he'd see us tonight so I guess Tuesday's AC360 will be live from Florida? Stay tuned. And speaking of Anderson's travels any guesses to where he was last week? We'd heard he was on vacation, but couldn't really verify where, until today. We can now tell you he was in Italy. How do we know that? Read and learn. Can you believe it? It's ATA's 2 year anniversary! I know that's not a long time in real time, but in the world of Anderson Cooper blogs it's an eternity. When I began this site, 2 years ago, I had no idea how much work it would be... or how much fun it would be. It has given me some of the closest friends in my life and that is the best reward one can ever hope for. If you go back through the archives (it's now in calendar form on the sidebar) you'll see the history of ATA unfold. First to join the team was Purple Tie. I don't know how I ever convinced her to leave what was the best Anderson Cooper blog at the time, Anderson Cooper Corner, but I'm just so glad that she did. Next came our master researcher Quitty. Actually she was Quitman at the time. Our Ms. Sheryn started calling her Quitty and it stuck. And speaking of Sheryn she gave up her excellent AC blog to join the fun next. I think she thought it would be less work to be part of a blog team, but it kinda hasn't worked out that way. What time she saved is now spent twofold researching, uploading clips and emailing with her blog buddies. Like I said before we are a very close bunch. This year, we branched out by creating our sister blog, All Things CNN. And this year has also brought us 3 more contributors. 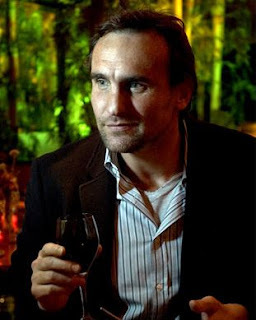 Our wonderful Book Asylum, who is another excellent researcher and to whom we owe a huge debt of gratitude for implementing the new blog design. I have learned through this entire process that BA is a most patient person. She never complained about all the tweaks and design changes, just tried to make it work. Besides being a programming wiz, she always finds new and unique news to blog about. And our sweet Sapphire. She is always there to lend a helping hand. And last, but certainly not least, my friend Cyn. She was an old hand at blogging when she joined us. Her Michael Ware blog is the gold standard for fan blogs. And I would be remiss if I didn't mention our wonderful graphic artist, Lori, who is always ready and willing to create whatever wild and crazy ideas we come up with. And she gets all the credit for our new, fabulous banner. She's got a few surprises up her sleeve for the upcoming holidays so stay tuned for that. Now onto the news of the day. 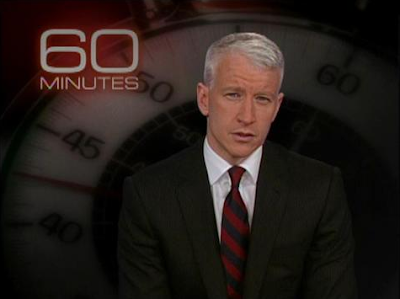 Did you catch Anderson's segment on 60 Minutes? It was fascinating. I've read a bit about this phenomena but I really had no idea that the recovery was as dramatic as what we saw in AC's segment. Part of the report was AC having a MRI to observe verbal stimulation to his brain. Again very, very interesting. If you missed the program Anderson's segment is posted on the 60 Minutes website. We have one more thing to celebrate today. It's Purple Tie's birthday. I really have to say a hasty adieu. The ladies have already popped the corks on the champagne and the celebration has begun. Happy Birthday PT and Happy Anniversary ATA! Anderson has a piece on 60 Minutes this week entitled "Awakenings". It is about "minimally conscious people - those who can't talk, walk or eat, but are not in a vegetative state - actually re-awakening thanks to drug therapies." To see an interview with Anderson about the segment, click HERE. One of the people featured is George Melendez whose parents have created a tribute website for their son at www.georgemelendez.org. Guess what the drug was George took that re-awoke him? Ambien! Yes, Ambien. The same drug that Sanjay did a report on back in March of 2006 where he talked about people sleep-driving and sleep-eating after taking the drug. Here is the clip if you don't remember the segment. Have you voted for your favorite CNN hero? I had a hard time trying to decide my favorite. They all have done extraordinary things. You have until Monday 11/26 at 12PM EST to cast your vote HERE. When you hit the internet Monday be sure to come by and see us here at All Things Anderson. We've got a little somethin', somethin' we want you to see. I hope everyone had a good Thanksgiving and didn't eat too much! Now we only have a few weeks until Christmas is upon us and the mad hunt for Christmas presents has begun, judging from the amount of people shopping today! According to Interbridge Anderson is going to be a guest on the Ellen Degeneres Show on Tuesday, Nov 27th! That should be fun. I hope he dances but somehow I think Ellen will be hard pressed to get him to do that in front of an audience! And last but not least tonight, I thought I'd include another puzzle for everyone. Good Luck! Good Evening everyone. By now the turkey has been cooked, the pie has been eaten and the football games are over. As I am the only one of the ladies not celebrating Thanksgiving today (Canada has Thanksgiving in October), it made perfect sense for me to take tonight so the other ladies could spend some time with their families. I have to say I had a plan for my evening but then the way plans tend to go sometimes, they we throw out the window. We had our first snow fall in Toronto today and due to some unfortunate circumstances it took me three hours to get home from work. Now it would be easy to complain but then I remembered how truly good I have it and that this little blimp in my plans is no reason to lose sight of what is important. I believe it is very important to live your life with an attitude of gratitude. I believe it is important to be thankful for the blessings I have everyday and not just on a specific day set a side for thanksgiving. I am so grateful for my family and friends. I am thankful that I live in a country where I can believe and say whatever I want. I am thankful for my health and the health of all those who are special to me. I am thankful to the ladies I blog with here at ATA. In this past year I have gained six wonderful friends that I know I can count on for encouragement and support. I am thankful to all of you who come to read and comment here on ATA. You make blogging and all the time that goes into it worth it. 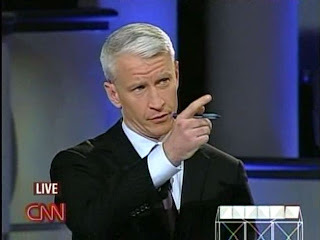 And I know it sounds cliché but I am thankful for Anderson Cooper. Because of Anderson I have had the opportunity to create so many wonderful connections and friendships. Anderson will probably never fully get the existent to which he affects people but for that that reason I am grateful. Now on to some Anderson related items. Since there was no 360 tonight I have a bunch of great little bits and pieces for everyone tonight. Before Ms. Phebe went to have thanksgiving dinner she sent me a great find from the Huffington Post. Many news reporters and anchors took some time to share what they are thankful for. "I know that Michael Vick is thankful for Larry Craig, who pushed Vick off the top of the news. Vick is thankful for Bernie Kerik for the same reason. And Kerik thanks Barry Bonds. And I, always, give thanks for Judith Regan." You can read other media personalities such as Aaron Brown, Arianna Huffington, Bob Woodruff, Brian Williams, Charlie Rose, Howard Kurtz and many others by clicking here. Also check out All Things CNN for some videos Ms. Phebe posted tonight from this morning American Morning with John Roberts and Co. It is quiet funny! Tonight, taking preemptive strikes to "The Nth Degree." Now, when the U.S. went into Iraq this year, it was the first time in history the U.S. had attacked another country for the stated purpose of preventing that country from possibly attacking the U.S. in the future. At the time, some people worried that this would establish a precedent justifying anyone who wanted to make a preemptive attack against a presumptive threat. Well, according to a report by WGAL in Pennsylvania, that's exactly what's happened. With Thanksgiving bearing down on them, the turkeys of Lancaster County have decided not to wait for death to find them. As seen in this dramatic night scope video taken during the day two turkey commandos launch multiple attacks on passing convoys. Some survivors came forward to tell their stories. UNIDENTIFIED MALE: I just call him the attack turkey. UNIDENTIFIED MALE: He's a mad, mad turkey. COOPER: One witness even recited part of the attacker's political manifesto. True, in their rage, the turkeys have failed to find any weapons of meat destruction, but they have succeeded in putting the world on notice that they will not stand idly by while others plan their demise. And tonight I leave you with some great clips Book Asylum sent me of Jeff Corwin appearing on Ellen Degeneres show yesterday to promote PIP on Animal Planet. These clips are way too cute. So I would love to hear about the thanksgiving traditions you engaged in today. Again my warmest wishes to all the ATA readers and their families who celebrated Thanksgiving and good luck with the shopping on Black Friday. I will be back in a few weeks.